It is a system that starts with the extraction of raw materials from the ground and their processing into usable materials. This is followed by the materials being used to manufacture products in factories (called production). The next two stages are the distribution of products to retail outlets or direct to the consumer (consumption). The last stage, at the end of the products useful life, is disposal. This elementary way of describing the Materials Economy, reveals a simple but important flaw with the system. It is unsustainable. The system affects everyone. Billions of people are employed in the Materials Economy (see below). Working conditions - Health and Safety. CAN THE SYSTEM BE CHANGED? 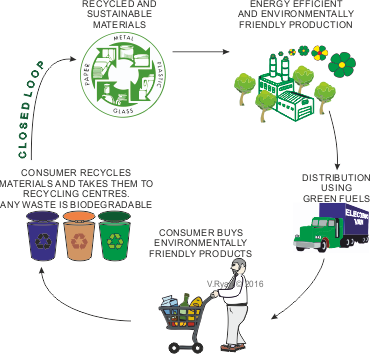 Use only recycled and sustainable materials (close loop system), when manufacturing. Use environmentally friendly fuels such as biofuels, hydrogen cells, wind power, solar power - electricity to power our transport system and homes. Consume fewer products and demand long lasting sustainable products, not ones that end up being disposed of / dumped.